With all of the luxury sedans on the market, it can be overwhelming finding one that meets your needs. At Sandberg Volvo Cars serving Lynnwood, our team can help. 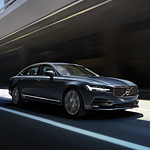 The Volvo S90 Momentum trim comes with a variety of features that provide drives and passengers with exceptional styling, comfort, and convenience. The Volvo S90 Momentum is the only luxury sedan in its class to offer a panoramic moonroof with a power sunshade as a standard feature. The panoramic moonroof allows you and your passengers to enjoy natural lighting, fresh air, and superb views of the sky. The interior of the Volvo S90 Momentum offers rear seat passengers more leg room than its competitors, such as the Mercedes-Benz E-Class, the Audi A6, and the BMW 5-Series. Your back-seat passengers will have an additional 4.5 inches of leg room so that they are provided with plenty of space to stretch their legs.